I am the queen of dieting…or one of millions of queens on the diet carousel. Round and round we go…and keep hopping off before the ride ends. I have done this ever since I became a mother. Especially after I was diagnosed with Hypothyroidism. I ballooned up after my second daughter was born…I literally felt and looked like a pufferfish. I thought I had post partum depression really bad…I was miserable. I finally went to the doctor after about seven months of misery. He thought it was depression too, since I had it after my first pregnancy. But thought more of it, and decided to do a full bloodwork up to check everything. Thank GOD he did. I was handed a pamphlet about Hashimoto’s ( Hashi what?!! A side note-I never have heard a doctor say this again in fourteen years…), started my meds immediately, lost about thirty pounds in a couple of months with ease, and never looked back…until my next two pregnancies…and turning 40. So this still very young body of mine has felt to be about eighty for the past few years. It got progressively worse after our son was born. I had him when I was thirty-nine going on forty. The weight wouldn’t budge…even with two years of nursing( all the supermodels and celebrity moms SWEAR the pounds melt off with nursing) and changing my diet…I said to myself- I give up. I am just going eat pizza and drink regular beer and have as many cupcakes as I want. Why bother? Then I kept getting sick…sinus infection after sinus infection. On my last bout of illness in March(including a breast scare), I went to the doctor for yet another antibiotic…my blood pressure was abnormally high for me (150/100) and my sugar was elevated as well as cholesterol…my knees ached, and couldn’t bend a few of my fingers without pain. 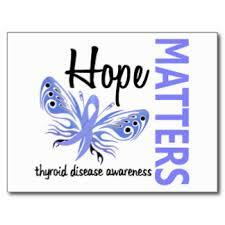 The nurse informed me it isn’t my thyroid because my labs are ALWAYS normal…it is age. I am getting old, so therefore losing weight “will be an uphill battle from here”. Is this lady really saying this to me right now??? I was miserable. I was sick. And I was especially sick of being sick. I got a call a few days later from my doctor to inform me that I need to see a nutritionist now because I was pre diabetic. I needed to get the weight under control. I was informed at the nutritionist that I was “obese”…my heart sank. How was this woman calling me obese?!! I know I am a little chunkier than a few years back…but obese?!! What is going on with me? After a somewhat informative visit to the nutritionist, I decided she was telling me everything I already knew and was doing. But I was still “obese”. I started googling, and scanning the internet and facebook for all things thyroid. Facebook had it all. This is why I stick around, Mark Zuckerberg. Which brings me today (for fear of overloading you with too many details). My new journey started at the end of May. I found an integrative nutritionist who gets it. Who listens. Does that actually exist anymore? Thankfully it does. She does. I have been losing the weight slowly but I am down twelve and a half pounds since I started eating healthier(or so I thought) on my own in January to lose the weight. But with my new doctor, I have a new clean diet, more energy and a healthier outlook. Except for one roadblock-my thyroid. The piece de resistance…I went to my GP the other day to beg and plead to have complete thyroid panel done ( they have refused constantly and even for the need to get a referral to see an endo) and a A1C test done (recommended by both nutritionists) to see what is going on with my sugar level. SHE AGREED!!!! Can I just say I have NEVER been happier to go to the lab for blood work?!! I literally danced when I got out to the car…it was a small but oh so important victory. See, they can say no all they want to do this test or that. But I know my body. I know that even with my new diet and way of thinking, something is still not right. So as I end this blog today, know that I will be making this a good karma kind of day…victory is MINE (as Famous Footwear tells me regularly via emails)! Update since original post: I have been officially diagnosed with Rheumatoid arthritis after FINALLY confirming I had Hashimoto’s fourteen years later. I may also have psoriatic arthritis and this seems to flare when I eat something that is a “cheat”, yet another food sensitivity, or not on my AIP. I have successfully lost a little over twenty pounds…slow and steady. (Note to all Autoimmune sufferers…Gluten is NOT your friend! Eliminating Gluten brought me more relief than anything)…But most importantly, I FEEL better! Not so many aches and pains and my energy level is amazing…all priceless accomplishments for anyone suffering from an autoimmune disorder.